The Summer Set seeks to find a new identity in the form of catchy pop rock. It appears that the Summer Set are in the midst of making up its mind about who the band is. Which is, of course, a good thing considering the number of bands toeing the line between genres and attempting to cater to as many audiences as possible. Just take a look at All Time Low, whose recent major label debut Dirty Work follows in the footsteps of many a pop-punk band that can’t seem to decide which side of the fence to land on, and in the process, alienates a plethora of potential listeners. Perhaps in order to make a mark on the musical landscape, a band must leave behind old tendencies, even if some of those very tendencies are what drew fans to its sound in the first place. 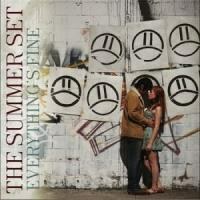 There’s no more mistaking the Summer Set as a pop-punk band. The Scottsdale, Arizona act has officially abandoned any and all notions that might lead to believing that anything about this band is “punk”. Gone are the aggressive and snotty choruses of songs like “Chelsea” and “Boys You Do (Get Back at You)” that helped the band make the scene two years ago with the debut full-length Love Like This. Instead, the band has chosen to embrace its pop side, creating songs that could easily play alongside the likes of Taylor Swift. Last summer’s EP of cover songs, Love Like Swift, should have come as no surprise then, rather a foreshadowing of things to come. The band’s latest outing, Everything’s Fine, follows the decline of a young romance told through the sounds of bouncy hooks, poppy guitars, and clean vocals all swirled up in a whirlwind of sugary-sweet production. Unfortunately for a young band with an obvious talent for creating summer soundtracks, the first thing that stands out about Everything’s Fine are the lyrics, which are likely to be some of the most painfully cheesy you’ll hear this year. Brian Dales' extremely infectious voice is often times belittled by his own songwriting. “When We Were Young” features lines such as “Thought we were cool, listening to Zeppelin / Making out on the Stairway to Heaven”, which perhaps will only momentarily distract the listener from the fact that a band consisting of members all between the ages of 20 and 22 are actually writing a song about youth in the past tense. Boy do I feel old. Meanwhile, “Back to the Start” includes the unoriginal lines “I miss your touch, I miss the late nights / I wish you never would have gotten on that plane / Did you get scared or did I love you too much? / I guess that’s why they call it the runway." At times, it feels as if we’ve heard this all before. On the bright side, the band does show some flashes of real potential throughout the album’s eleven tracks. Lead single “Someone Like You” serves as a prime example of Dale’s ability as a vocalist while the rest of the band creates the perfect backdrop to capture the song’s summer pop feel. Album opener “About a Girl” perhaps best showcases the band’s growth, as the track builds from an acoustic opening into a full-on orchestral treat as Dale’s vocals soar over Jess Bowen’s drums. The fantastic guitar work of John Gomez and Josh Montgomery lead into one of the year’s catchiest choruses on “Begin Again”, which features a bit of the bite found on the band’s last album. Likewise, upbeat number “Mannequin” captures the brokenhearted angst of young love gone wrong as well as a pop song could be expected to do as Dale sings “He'll pick you up just to knock you down / One day I'll see you both in hell." Everything’s Fine is far from perfect, and upon its first few listens may prove a disappointment for fans expecting more of the same, or even an expansion on, the spunky sounds of Love Like This. There’s no shortage of music listeners who have experienced the frustration of their favorite band “selling out” or abandoning a signature sound in favor of more popular trends. The Summer Set is a young band, and as such, should be allowed to grow and experiment while finding its niche. There’s an old adage about taking one step forward and two steps back, but this notion doesn’t apply to Everything’s Fine. If anything, the Summer Set may have taken a short step back in order to take some very large steps forward in the near future. The talent and drive is there, and with any luck, fans will get to see the potential of this band come to fruition very soon.